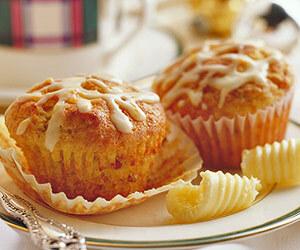 Orange juice flavors these walnut-filled muffins. Serve them warm with a cream cheese spread for breakfast or brunch. In a large bowl, combine flour, granulated sugar, baking soda, baking powder, and salt. Make a well in the center of flour mixture. In medium bowl, combine egg, buttermilk, orange juice concentrate, and melted butter; add all at once to flour mixture. Stir just until moistened (batter should be lumpy). Fold in walnuts. Line twelve 2-1/2-inch muffin cups with paper bake cups. Fill the cups 3/4 full with batter. Bake in a 400 degree F oven for 18 to 20 minutes or until muffins are golden. Remove the muffins from the pans. In a small bowl, combine powdered sugar, orange peel, and enough orange juice (2 to 3 teaspoons) to make a drizzling consistency. Drizzle over warm muffins. Makes 12 muffins. * To make 1/2 cup sour milk, place 1-1/2 teaspoons lemon juice or vinegar in a glass measuring cup. Add enough milk to make 1/2 cup liquid; stir. Let the mixture stand for 5 minutes before using it in a recipe.